The influenza virus, usually referred to simply as the flu, is common and profoundly contagious. It can cause serious complications in infected individuals, especially children. Tamiflu (oseltamivir) is an antiviral medication prescribed to counteract the flu virus in people at least 2 weeks old who have had symptoms -- fever, chills, body aches and pains, cough, fatigue -- for less than 2 days. Even though studies show that Tamiflu can decrease the duration and severity of the flu, children may not be apt to take it because of its unpleasant taste. Tamiflu works by preventing the influenza virus from efficiently attacking and replicating in the cells of its host. As such, the World Health Organization recommends this medicine as a first-line defense against the widespread form of the influenza A virus, H1N1. The sooner after exposure to flu a person receives treatment, the more effective Tamiflu is at preventing illness. Unlike vaccination, which requires the body to build up antibodies over time, Tamiflu protects immediately. Thus, it is also prescribed to lessen the spread of the flu in susceptible people over the age of 1. Research suggests that Tamiflu can help with the duration of flu symptoms in children, as well as its complications. A clinical trial published in the February 2001 "The Pediatric Infectious Disease Journal" showed that Tamiflu cut the length of symptoms such as headache, low energy and muscle pain by 36 hours and fever by 25 hours, when compared with children who received no treatment. Another study published in the June 2008 "The Medscape Journal of Medicine" showed that children under 12 who took Tamiflu within 1 day after influenza exposure were 53 percent less likely to develop pneumonia, 28 percent less likely to develop respiratory illnesses and 39 percent less likely to develop ear infections than children who received no treatment. -- Pour a small amount, about 1 to 2 teaspoons, of sweetened liquid into a cup or bowl. -- Gently open the capsule and empty all of its contents into the cup or bowl, or pour the liquid medication in with the prepared syrup. -- Use a spoon to allow the child to drink the entire liquid, or draw up all of the contents into a syringe and administer it to your child. In order for the medication to work properly, all of it must be ingested by the child. It is, therefore, imperative that all of the dose -- be it liquid or powder from a capsule -- be mixed in with the thick liquid. Additionally, the only way to guarantee that your child consumes all of the Tamiflu he's been prescribed is to ensure that he drinks all of the mixed liquid. Leaving out any of the medication or taking only part of the syrup mixture could result in delivery of an inaccurate dose and incomplete protection from the flu. 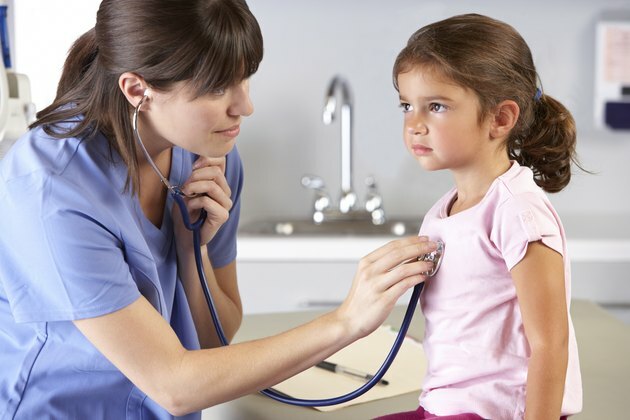 Warning signs of flu in a child that warrant emergency medical care include: -- Labored or difficulty breathing. -- Trouble arousing from sleep. -- Fever with rash. -- Poor feeding or unable to keep food down. -- No tears when crying or sunken soft spot and decreased wet diapers in babies.